Departure from Touristic Pier sailing through the wide Ushuaia Bay until reaching the Beagle Channel, through Paso Chico. There we sail around both Birds and Seals islands (they belong to Bridges archipelago). Arriving at the Les Eclaireurs Lighthouse we can appreciate imperial and rocky cormorant’s colonies. We continue sailing towards the East enjoying wonderful landscapes of the channel and mountains; at this point we will see Puerto Almanza on the Argentinean coast and Puerto Williams on the Chilean coast. Then we will arrive at Isla Martillo where we will observe a colony of Magellanic penguins. 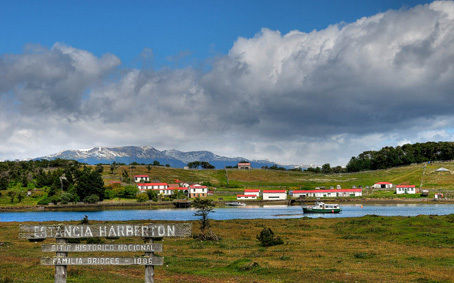 We continue sailing to Estancia Harberton where we disembark to visit the ranch and the Acatushún Austral Marine Mammal and Bird Museum (not included). The return to the Touristic Pier in Ushuaia is a ground transfer by Complementary Route J and Route 3; a stop at the lookout point of Garibaldi Pass will allow us to observe and photograph the lakes of the area: Escondido and Fagnano. Important: navigation from the Touristic Pier located in Ushuaia to the Estancia; ground transfer to return to the same pier.